I’ve always thought that my kids were as slippery as seals, especially in the water. For them, it’s all about diving, playing and splashing in the ocean. This time, though, they aren’t alone – real baby sea lions are swimming right along with them. We’re on an adventure family vacation in Baja, Mexico, organized through Boundless Journeys, and this is only one day of many in the crystal clear water of the Sea of Cortez. We decided to try out Boundless Journeys (www.boundlessjourneys.com) for a different kind of family vacation, largely because of their excellent reviews. 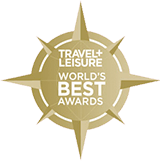 They’ve been selected as “One of the Top 10 Tour Operators in the World” by Travel + Leisure magazine and one of the “Best Adventure Travel Companies on Earth” by National Geographic ADVENTURE magazine. Sure, we’ve done the all-inclusives in Puerto Vallarta and Riviera Maya, and we’ve had a ball when we were there. 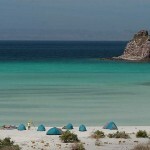 But here in Baja, we’re camping on a beach and exploring the blooming desert a week after the season’s rains. We’re physically challenging ourselves every day by kayaking and hiking, snorkeling and swimming. And then we’re relaxing back at camp, as the talented and hospitable staff cooks the fish we catch, plus a heck of a lot more. Let me start by saying that we aren’t usually as physically active as some of the other folks on this trip. There are some pretty darn good fishermen, some people who kayak every weekend (even in the freezing waters of the American Northwest), and some people who just have that “I should be on Survivor” look. But it’s truly not a big deal. First, our guide, Miguel, assumes that all of us are novices and runs us through kayaking techniques and “wet exits” (important for when your kayak tips over) before we’re allowed out on the bay. Second, the group is all about bonding and helping each other, great for little and big guests alike (I’ll admit that I occasionally needed a hand getting in and out of the motorized skiff, for example). I’m especially happy about the fact that everyone’s a good sport (a value I’m always trying to drum into my kids.) They’re all into enjoying the outdoors and not into competing over who can catch the most fish or kayak the fastest. 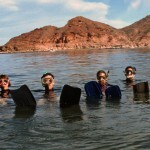 Espiritu Santo Island in the Sea of Cortez provides the perfect base camp for our exploration of this aquatic playground. And it’s easy – the outfitter provides motorized skiffs to take us to outlying islands and the locals’ favorite fishing and snorkeling spots. Over the course of five days, we see it all: hidden coves with bird estuaries chock full of colorful birds, white sand beaches, interesting rock formations with caves (no lions in them, much to the kids’ disappointment), and several coral reefs. And of course, there’s always the choice of relaxing on the beach with a good book, soaking up the warm Baja sun. Our trip started with an admittedly long trip from Philadelphia to Charlotte to Mexico City to La Paz, a city of 300,000 on the very tip of Baja. It all actually wasn’t so bad, though, considering that no single flight was longer than about three hours. The hardest part? Navigating through the Mexico City airport, where the international terminal is several miles from the domestic one. We had to take a bus from terminal to terminal – no biggie, except that the signage was very poor, and we walked up and down a long concourse several times before we finally figured it out. (Tip: Other trip participants connected through Guadalajara or Los Angeles, so check into those options, too). Once we arrived in La Paz, it was a cinch – Miguel picked us up at the airport and took us the short distance to La Perla, the waterfront hotel where we stayed overnight. La Perla was nice but basic, but for us it was all about getting to the beach camp. Early on Day 2, we headed out on the skiff to our comfortable beach camp on Espiritu Santo Island, about a half-hour ride from the La Paz marina. We were excited to see the extremely comfortable and spacious tents where we’d sleep, although the latrine (a chemical “potty”) was a little less appealing for some, despite the fact that it was situated behind a tarp with a great view of the hills behind our camp. After a lunch of sandwiches, chips, and fruit, we received an introduction to the island and a sea kayaking orientation, then began to explore the coves and deserted beaches. By the way, when I say “deserted,” I mean it! One of the most special parts of the trip was the fact that we were completely isolated from the “real world.” True, the staff had a clunky cell phone for emergencies, but otherwise we had no cell coverage, no Internet, no electricity, and no clocks. On Days 3-6, we explored the area, led by Miguel, our friendly and knowledgeable guide. Not only did we paddle along the shoreline (discovering hidden lagoons and pristine beaches), snorkel among colorful fish in the coral reefs and swim with sea lions, and hike into canyons for stunning vistas, but we also learned a lot. Miguel was constantly narrating, teaching us about the local plant and animal life, as well as the history and geology of the area. Back at camp, he even used illustrated field guides to point out the birds and fish we’d seen. Probably our favorite part, though, was the relaxing time on the beach. In the evening, the staff prepared snacks and pina coladas or margaritas (alcohol-free for the non-drinkers). The sunsets were spectacular. Because we were in the desert, the dust mingled with the light to create a bright orange spectacle in the sky. Once the sun was down and the moon was up, the stars were almost bright enough to read by – in fact, a couple of times we woke up in the middle of the night and ventured out of the tent just to watch the moon set across the bay. And sunrise was just as pretty, especially because the staff brewed some of the best coffee I’ve ever had. It was hard to head back to La Paz on Day 6, leaving our camp behind. At the same time, we were eager for a real shower (although the camp had a little fresh water shower for rinsing, we bathed in the ocean) and a bed. We rested a while, caught up on email, and took a dunk in the hotel pool, then all met for dinner at a local seafood restaurant (not nearly as good as the camp cooking) to say farewell. We took home a lot of incredible photos, some deep tans, and some sore but strengthened muscles. Best of all, though, we took home some new confidence: that we, unused to real physical challenges, could enjoy and handle days filled with exercise and activity – much like those baby sea lions, swimming and paddling off the rocks of the Sea of Cortez. 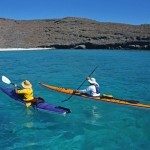 An afforable, active vacation for families, friends, and individual travelers: Mexico: Baja and the Sea of Cortez Adventure; 2010 dates April 10-16 and October 24-30; Trip price: $1895. For more information, call 1-800-941-8010, oremail deborah@www.boundlessjourneys.com.